In the simplest terms possible, TCM is a way of looking at ourselves and our world that sees everything as a whole and considers everything in context. In TCM this perspective is called "taking whole." How is it related to "Oriental Medicine"? TCM is the official form of Chinese medicine practiced in the People's Republic of China, and is one of the many systems of medicine that can be classified as "Oriental medicine." Oriental medicine is a term that encompasses diverse medical theories and applications developed and practiced in the Far East, including China, Korea, Japan, Taiwan, and Vietnam. TCM is probably the most frequently encountered and most familiar of the Asian medical systems, and it has an extensive body of literature and research supporting it. Today TCM is practiced throughout the world, with about 14,000 practitioners in the United States alone. As more and more people explore new ways of complementing their existing healthcare, it's not unlikely that you know someone who uses this ancient Asian system. For these reasons, TCM is an excellent starting point to learn more about complementary medical systems from Asia. Where does TCM come from? 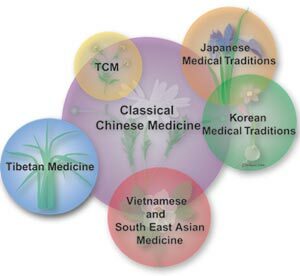 TCM is a direct descendant of one of the oldest and continuously practiced systems of medicine in the world, and can trace its roots back 2500 years. Since its inception, Chinese medicine has evolved and developed into a very sophisticated and rational system of medicine influencing and being influenced by the many cultures and systems of medicine it has come into contact with along the way. Today Chinese medicine continues to develop in new and exciting ways and is utilized by millions of people around the world. It is truly a world class system of medicine! To understand the context in which TCM is practiced, do the activity: Experience a Different Worldview.